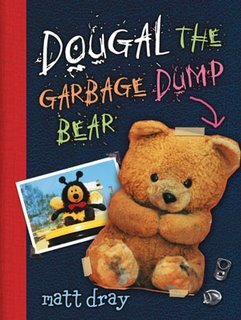 Dougal the Garbage Dump Bear by Matt Dray. Originally published in Australia. The Plot: Dougal isn't one of the little girl's shiny new toys. So after getting left out in the rain, he gets tossed in the bin and taken to the garbage dump. What will happen to this shy bear with a heart of gold? The Good: After ending up at the dump, Dougal makes friends, first with the trucks, then with the worker, and finally finds a friend in Bumble Bee. By the end, over 45 toys have been rescued. The story is told with photographs, arranged on the page as if in a scrap book. The tale is a bit wacky -- how Dougal finds happiness in a garbage dump. By the end of the book (spoiler!) he is living in a beach front house with trips to the dump and friends. "Sometimes bad things happen so that good things can happen. You just had to make the best of it." Also funny is when Dougal and Bumble join the men after work to play pool, drink ginger beer, and feel sick the next day. The people in the photos are always shot from behind, or just a part of them is shown -- an arm, a leg. But I got a kick out of thinking about these guys taking stuffed animals to the pool hall. But I was wondering about drunken stuffed animals, so I looked up Ginger Beer, and it's what we in the US call Ginger Ale. So Dougal isn't hung over from beer, he's feeling bad after a late night with too much sugar. My niece likes that DTGDB has real photos of real toys. And it has the beach. And she loved the new word "Blimey." As we finished reading it this morning, I was struck by its similarities to Elsewhere. Both have main characters that are forced from the life they want and have to make a new life for themselves. An interview with author/photographer Matt Dray reveals that Matt was working in a garbage dump when he met and rescued "Dougal" and was inspired to write this book. Book Buds review is here.